Jon Stewart, hiker and author. He is my high school friend, and he has an alter-identity, that of Basmati. It's a nickname known to only a select few. He won it over the course of two or three arduous sojourns in the wilds of Oregon, Washington and California, when he hiked the entire length of the Pacific Crest Trail.. Somewhere along the way, Jon became known to his fellow long-distance hikers ("thru-hikers") as "Basmati," a name arising from the two tours of duty that he spent in Nepal as a Peace Corp volunteer who had special training in agriculture related to new forms of nutritionally superior rice that could boost the diet of the struggling farmers of Nepal. Jon Stewarts books: Jon also has a degree in journalism, which explains that he is the author of no less than three thick books about the great American long-distance trails. These are not just travelogs; Jon's books are often penetrating analyses of the state of wilderness in America today. Click here for more information on the three books and how to get them. In 2006, he walked the last mile of the PCT trail to completion, from Mexico to Canada, all on foot, and to the tune of 20-30 miles per day. During summer 2007, Jon, back in his role as Basmati, took on a new challenge, the wilds of the Rocky Mountains. 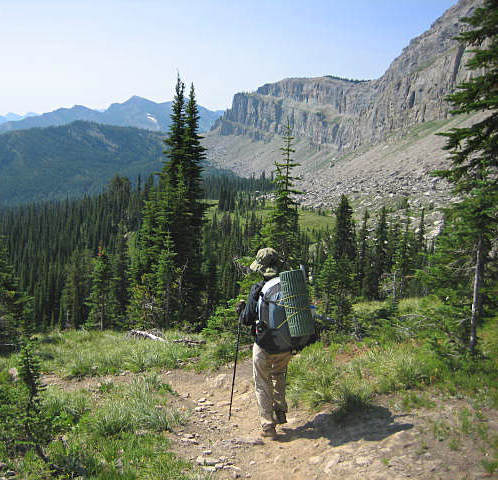 His goal was to hike the northern third of the CDT from Glacier National Park to approximately Yellowstone.This, it turns out, is in most ways a tougher proposition than either the Pacific Crest Trail or the Appalachian Trail. There are grizzly bears nearly everywhere, and rattlesnakes in the lower, drier stretches. Mostly, there are endless miles of challenging/frustrating route-finding and potential unwanted side-trips... It is very, very easy to go astray while trying to follow this very undeveloped trail.....CDT history-- famed "Triple Crown" hiker Eric Ryback was one of the first "big name" hikers to do the CDT-- that was in 1972 (he did the Applachian Trail in 1969, and the Pacific Crest Trail in 1970)....Back to my friend Jon....In 2008 Jon returned to the CDT, this time hiking south from Rawlins, Wyoming to the Mexican border in western New Mexico....And to complete the CDT, in 2009 Jon hiked north from Rawlins through the complete Wind River Range and Yellowstone to Macks Inn, Idaho, "where I completed my hike of the CDT," remembers Jon. But in that year, Jon wasn't feeling done with hiking, so he then hitch-hiked a ride to Glacier National Park and, as he puts it without any drama, "hiked another 700 miles north from East Glacier to Jasper, Alberta, following the Great Divide Trail through the Canadian Rockies." 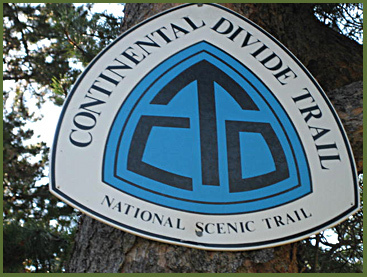 So in all, Jon hiked over 3,000 miles on the Divide trails. 2013: Since I first posted this page, Jon has hiked the entire Hayduke* Trail, possibly the most arduous and dangerous of the major trails. It runs a very unimproved, arid, mostly unmarked course of 850 miles from the Grand Canyon's South Rim to and ending far up into southern Utah. (* Hayduke is named for a character in Edward Abbey's famous anti-establishment book, The Monkeywrench Gang). 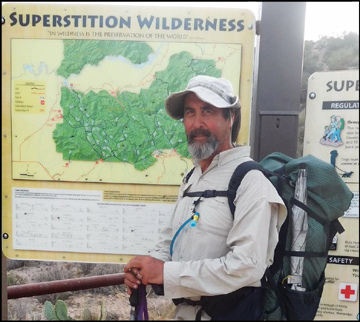 And in Fall 2016, Jon hiked 770 miles on the little-developed Grand Enchantment Trail (GET) from central New Mexico at Albuquerque all the way to Phoenix, AZ, following mountain routes composed of lots of route-finding and walking on dusty, vacant mountain roads and plagued by infrequent water sources. All in all, since he retired ten years ago, Basmati has hiked about 12,000 miles, much of it solo. Especially for a person of his age, a wonderful and remarkable accomplishment. And an inspiration to us all. 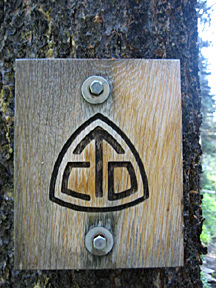 All trail pictures on this page are compliments of Basmati from his 2007 CDT hike (except for his self-portrail from 2016).... He describes the scene below, "this is a thru-hiker from Martha's Vineyard threading her way through the meadowed moraines below the Chinese Wall in the heart of the Bob Marshall Wilderness." Most of the Chinese Wall Trail runs between about 7000 and 7400 feet, with the rim above running generally about 8000 to 8300 ft...The Wall is massive and runs for many, many miles. The topo maps show a gentle, sloping west side, and then the steep cliffs breaking eastward, very likely the result of faulting....8576 ft. Cliff Mtn. is probably the highest point of the official, named portion of the Wall. The final CDT image (below) is of Dean Lake. The lake is located at the north end of the Chinese Wall. It's elevation is 7,365 ft, and Pentagon Mtn. above it is 8873 ft. 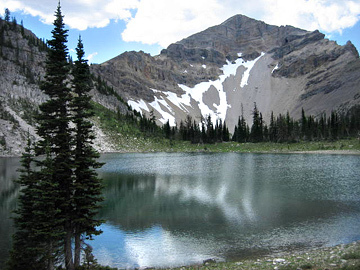 The lake lies a mile or two west of the Continental Divide, and lies within the mountain's east cirque. My maps show that this lake is actually in the headwaters of the middle fork of the Flathead River, which flows north and ends up in the southwest corner of Glacier National Park near famous tourist-trap, Lake McDonald.